College of Fine Arts 2011 Collaborative Research Scholar Callie Curry (SWOON), recently visited Tallahassee to work on a service project with FSU Department of Art Graduate students. In addition to planning and and leading the execution of improvements at The Tallahassee-Leon Shelter, Curry delivered an overwhelming well attended scholarly lecture. Curry is an internationally acclaimed street artist, whose realistic, life-size wheat-paste prints and paper cutouts populate abandoned buildings, bridges, water towers, galleries and museums around the world. Dozens of Florida State fine art students — both graduate and undergraduate — showed up daily to work on the project at The Shelter, which provides free, unconditional lodging and meals to between 120 and 150 homeless men and women each night. Students created a rain garden that will prevent water from flooding the courtyard where some of the homeless men and women sleep. They also began constructing a gazebo (some are calling it the Bunk-ZZZ-bo), which will provide additional shelter from sun and rain. The organizer of the event, Carrie Ann Baade, an assistant professor of painting and drawing at Florida State, brought in her painting classes to work on murals on the shelter’s walls. 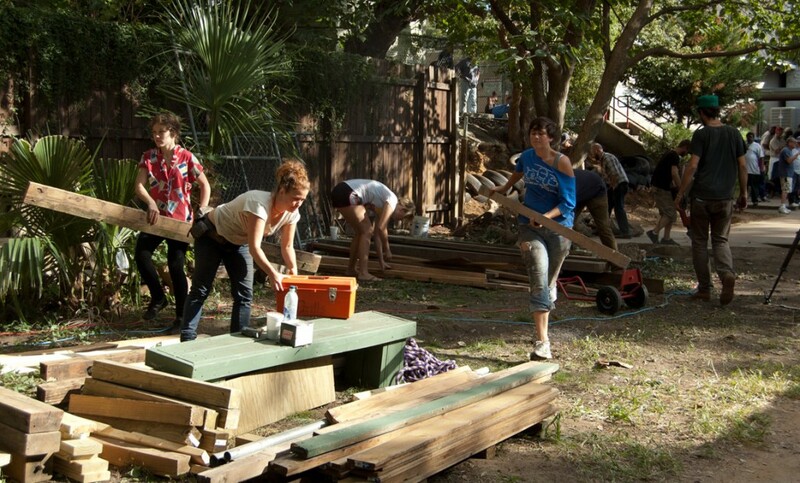 Florida State’s popular festival of the performing arts, Seven Days of Opening Nights, as well as the generosity of an anonymous donor, supported Swoon’s lecture and beautification project at The Shelter. Local businesses, including nurseries, trucking and gutter companies, donated both materials and labor to the effort. The FSU volunteer beautification effort at The Shelter will continue through the fall semester as students monitor their plantings and rainwater control efforts.